A proposed steep rise in fuel taxes in October 2018 with further rises to come ignited an angry Facebook rant from Jacline Mouraud which went ‘viral’. It was suggested that the growing group of supporters wear yellow high vis jackets, les gilets jaunes, and meet upon the streets to show their solidarity and protest together. The lady herself is taking legal action for “menace” et “diffamation”, against several opponents of the movement who have sent her hate mail, such as “Jacline au bûcher”, and “un jour, tu paieras pour toutes tes conneries”. In response she told journalists; “Ce n’est pas parce que j’ai fait une simple vidéo qui a fait éclater au grand jour la misère des Français qu’on doit pour autant me couper la tête”. 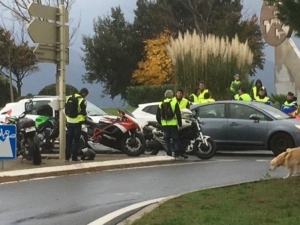 The first disruptions took place on Saturday 17th November when more than 250,000 people turned up in their yellow vests to block roads throughout France, at 2,000 separate points. Why didn’t the government nip this in the bud before it started? Probably because they didn’t realise the extent to which social media was succeeding in pulling unhappy and dissatisfied citizens together and giving them a collective voice to discuss and act upon their grievances. So who are the Gilets Jaunes? In theory, the gilets jaunes have no official connection to any political party, trade union or any other organisation or association. In practice though, most of the political parties in France are now trying to jump on to one side or the other of the yellow vest’s collective bandwagon. Apart from President Emmanuel Macron’s LaREM. There can be no doubt that there is strong support from the French people for this movement. In the provinces and suburbs, public transport is often inadequate and people need cars to go to work, to take their children to school, to live their lives. Some have bought diesel cars, encouraged by the previous government to be ecological, only to be told that diesel would be seeing a major price rise. Grievances have escalated from fuel to general discontent. The very rich often escape heavy taxation, the very poor often receive government help. What about that large group somewhere in the middle who seem to always end up paying for everyone else…..? As the protests spreads into the fourth week, and the small concessions offered by Macron are not accepted, all the government can do is hope that it burns itself out, due to its lack of solid leadership structure.